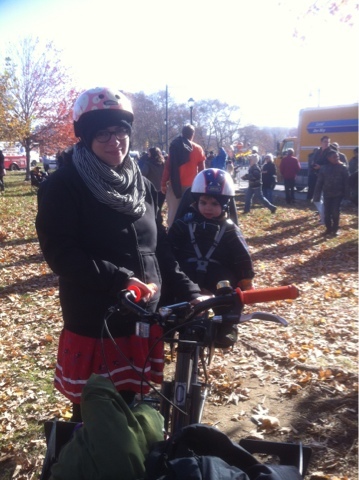 Quick blog and run but I wanted to unload some pics of our Thanksgiving ride to the Philly Parade. 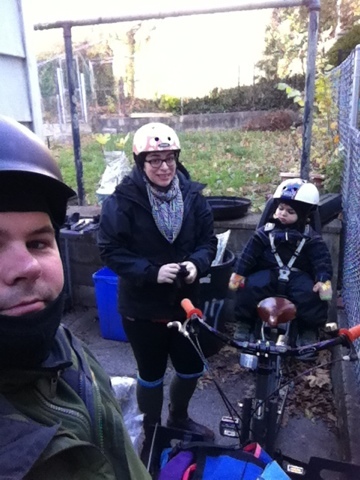 The 11 mile round trip ride was perfect mid 50s weather. I was stripping off layers by the time we got down there. Being 20 weeks pregnant also keeps a girl toasty! 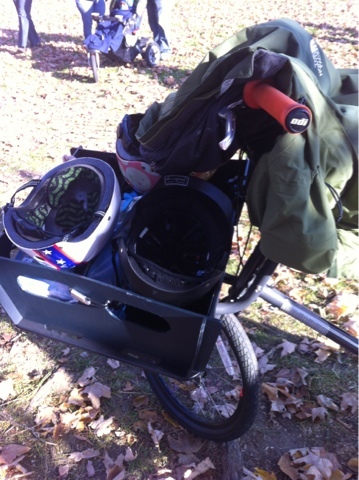 I rode the little guy down on the Halsted with the Yepp Maxi. 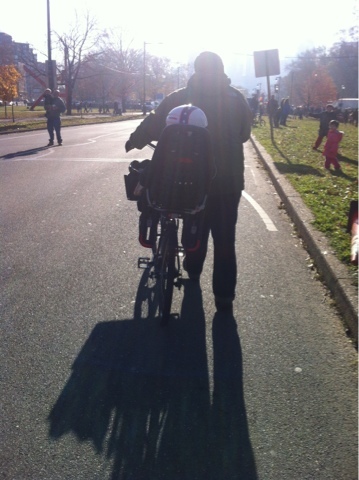 It's nice to be able to stand out of the saddle with him on back and he napped leaning forward into me on the way home which worked well. But the mini was great for instant smiles and communication with the little, I miss it! Wednesday morning my husband was back at work following Hurricane Sandy and I was itching to get the maxi on. 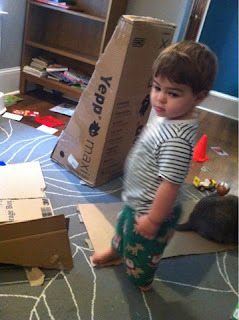 For the past couple of days we had been using the box as an indoor slide. So first things first I had to deconstruct the box. I bought the seat used off of eBay so I had to take inventory to see if anything was missing. 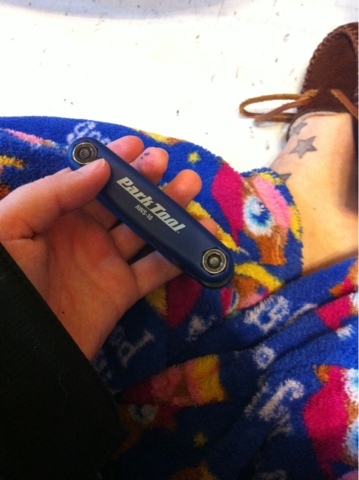 One extra bolt and the key to lock the seat were both missing, bummer. I need to contact Yepp, I hope they can replace the key. I "read" the Ikea like instructions and realized this wasn't as simple as the Yepp Mini's adapters (we used the standard on my road bike and the alternative for the Halsted). I moved all the items to the kitchen. I have to say the installation on a female step through looks way easier. I followed the instructions for male bikes. 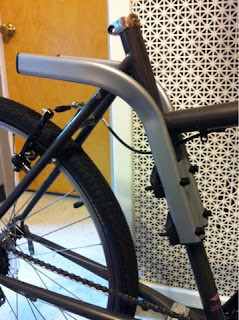 This includes taking the extra step of taking the adaptor apart to fit it over the seat post. More parts. 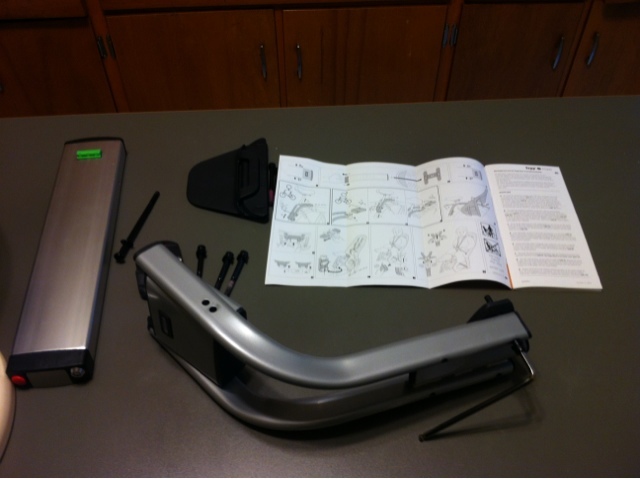 Yepp, like Ikea includes a tool but it was too big for me to maneuver taking bolts off so I used our Park Tools tool. 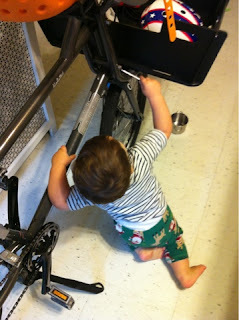 My little helper grabbed the Yepp tool and worked on tightening other parts of the bike. Thanks dude. So of course nothing is straight forward with me. Clumsy central. I drop a tiny bolt behind our radiator. Like beyond hand reaching distance. Fffffffffffff. I was pissed at my slippery hands and for working right next to the radiator. 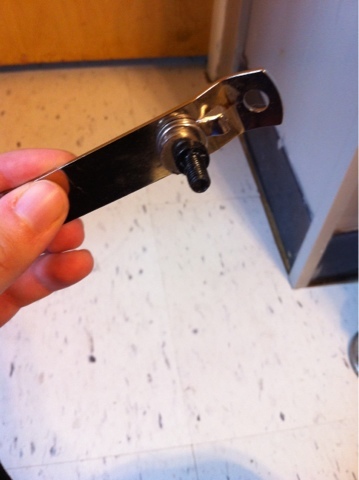 Well cue genius I use magnets and a bottle opener and magnetic force came to my rescue. Thankfully we have a bottle opener nearby. I finally get the rest of the adaptor back together. I curse a bit more getting the seat on. Because easy things get hard when you already have been frustrated. 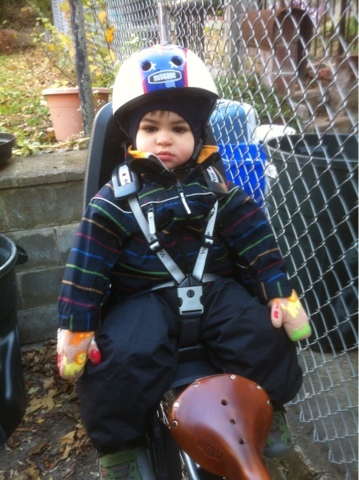 I get everything tightened and go to put the little guy on. I realized we need to reverse our kickstand to lift the front instead of back wheel. I tipped it back putting M on. Jeez. 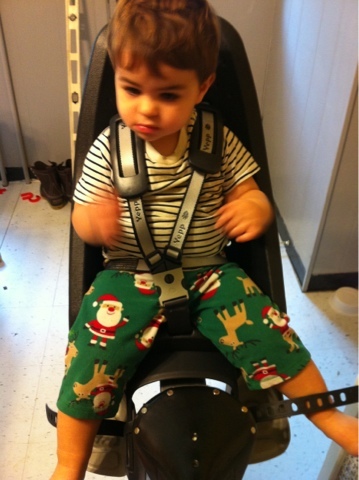 Little guy though was jazzed and I had to break it to him we weren't going anywhere as we were still in our pjs. Both seats fit fine on the Halsted and shockingly at 5'3" I could easily mount with both seats on although I think I'd prefer a step through but I know they aren't best to support loads. 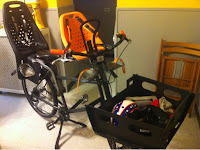 It is good to know when baby two gets here/big enough for the mini it will be option to ride with both yepps. As I told my mom while she was searching for gas in wake of the hurricane issues in my hometown I have an apocalyptic bike ready.